I've been kicking around the idea of coating a bird in glitter since the first sighting of so tweet chipboard in the new catalog. But then again I dream of covering everything in glitter :) what can I say once a girly girl always a girly girl. I did however encrust this birdie in a pale pink glitter first only to decide that it was to washed out looking, so little birdie got re-glued and coated in this chunky pink, much better. Coloring chipboard with markers is so cool, it looks dark at first but don't worry it will dry nice and even. I hope you like it! this made me squeal out loud! I just love, LOve, LOVE it shantaie!! Glitter is a wonderful thing - you'll have to keep checking back at the blog if you love it!! so happy you joined in this week on the cuttlebug challenge! you'll come back next week, yes? So cute...love that little bird! Oh I LOVE this card! It is adorable and that little pink birdie is just beautiful!!! This card made me smile! WOW, WOW, WOW!!! LOVE that bird, with it's chunky glittery coat! And your pink and green colors are my faves. Thank you for being a part of the Cuttlebug Challenge today. You really rocked the sketch!! This is sooo cute! I love the glittery bird! Thanks for playing along! OMG! This is the cutest birdie ever!!! Hope to see your cards more often. You are very talented. Oh, this is so fun! I love the bird! so "tweet" indeed! ♥ your little birdie & great take on the sketch!!! 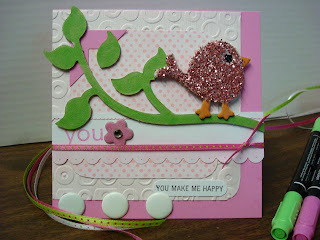 Shantaie, this is just gorgeous and your glittered bird is soooo adorable! Love it! Great take on Valerie's sketch too. Thanks for playing along this week at Cuttlebug Challenges. This is so cute! I love the glittery bird! Great job with Cuttlebug Be Inspired 20...thanks for joining us this week! Great card. Love the birdie. Great take on the sketch. The bird is perfect! I luv luv the bird, I luv glitter 2 mine is stickles, I stickle everything..